Hand up if you saw that result coming at Pittodrie on Sunday? Aberdeen losing to Rangers was not a shocking result to rock Scottish football to its core but a 3-0 win for the away side was a huge surprise. But let’s not get carried away. One result does not define a season and with six games remaining of the Scottish Premiership campaign you can bet Gers manager Pedro Caixinha would love to swap places with the Dons right now. Aberdeen have a nine point lead, effectively 10 points when you include goal difference. Only an almighty collapse from the Dons will let Rangers in to steal second place in the closing weeks. Now that would be a shock. The Dons have closed ranks this week. Press activity has been minimal as it has been time to batten down the hatches, go through the video nasty that was minutes 79 through to 83, analyse it and make sure it does not happen again. It will not have made for pleasant viewing for Ash Taylor and Anthony O’Connor in particular, nor Shay Logan, who was caught out of position for the third goal. However, as hard as it was, repeat viewing of the video nasty is a necessity. It is hard to fathom just how bad Aberdeen defended in that four minute spell. 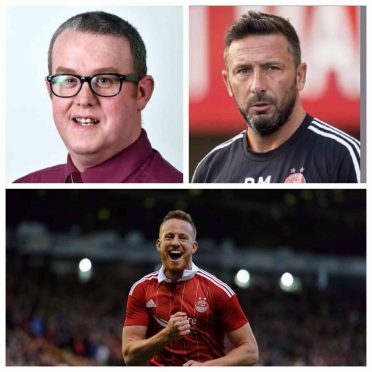 Derek McInnes didn’t see it coming and it’s safe to say neither did his players. They had been in complete control in the second half and there looked like being only one winner. But if Sunday’s events show anything it’s that football can swing very quickly from team being in the ascendancy to out of the game altogether. But enough about last weekend. It’s what happens now that matters. Aberdeen head to St Johnstone on Saturday for a game against a side who have been a thorn in their side in recent seasons. Last year’s 5-1 win for Tommy Wright’s side at Pittodrie was an incredible result but the Perth Saints seem to enjoy playing away from home rather than at McDiarmid Park. There has been little between the sides so far this season – one goal in fact with Adam Rooney’s last minute winner knocking the Saints out of the League Cup at the quarter-final stage. The two league meetings have ended goalless. The Saints are always tough opposition and Saturday will be no different. But with a big travelling support cheering them on the Dons can show Sunday was a blip and nothing more. Mark Reynolds is in contention for a return after missing the last six matches and certainly a return to the dogged determination and miserly attitude to conceding goals is required. The sight of a player in a red shirt taking his chance would not go amiss either following the squandered chances last weekend. Adam Rooney could have had a couple last weekend had it not been for Wes Foderingham in the Rangers goal. He’d love to see one or two nestling in the back of the net and so would his manager. With a Scottish Cup semi-final looming next week Aberdeen have played with confidence in 2017. They need to show it is still there. It should be.